If the Turks had wanted to massacre the Armenians; why didn't they just do it rather than spend 261 million kurush (156.6 million guilder, equivalent to 5637 million $; Francis Turner, Money and exchange rates in 1632) to remove the Armenians? The Ottoman Empire controlled twenty-two separate nationalities. None of those nationalities carries the hate, rage, and revenge attributed toward modern-day Turkey as the Armenians do. 1. On January 27, 1973, in Santa Barbara, California, Armenian Gourgen Yanikian, a U.S. citizen, invites the Turkish Consul General, Mehmet Baydar, and the Consul, Bahadır Demir, to a luncheon. The unsuspecting diplomats accept the friendly invitation. Gourgen Yanikian murders his two guests. He is sentenced to life imprisonment. 2. On April 26, 1973, in New York City, attempted bombing of the Turkish Information Office. The bomb was discovered in time and defused. A group calling itself the “Yanikian Commandos” claims responsibility. They want the release of the double murderer of Santa Barbara, Gourgen Yanikian, who insidiously murdered two Turkish diplomats. 3. On October 4, 1977, in Los Angeles, California, bomb attack at the house of Professor Stanford Shaw, who teaches Ottoman history at the University of California in Los Angeles (UCLA). Responsibility is claimed by an Armenian Group of 28. 4. On August 5, 1980, in New York City, an “Armenian group” hurls paint bombs at the Turkish House across from the United Nations, home of the Turkish Representations in New York. 5. On October 6, 1980, in Los Angeles, California, two Molotov cocktails are thrown into the home of the Turkish Consul General, Kemal Arıkan. He survived with injuries. 6. On October 12, 1980, in Los Angeles, California, a travel agency in Hollywood, owned by a Turkish-American, is bombed and destroyed. JCAG claims responsibility. 7. On February 3, 1981, in Los Angeles, California, bomb-squad officials disarm a bomb left at the Swiss Consulate. The terrorists threaten in anonymous phone calls that such attacks will continue until Armenian-American (U.S. citizen) Suzy Mahseredjian, who had been arrested for terrorist acts in Europe, is released. 8. On June 3, 1981, in Los Angeles, California, bombs force the cancellation of performances by a Turkish folk-dance group. Threats of similar bombings force the group's performances in San Francisco to be canceled as well. 9. On June 26, 1981, in Los Angeles, California, a bomb explodes in front of the Swiss Banking Corporation offices. Again, the work of the Ninth of June Organization. 10. On August 20, 1981, in Los Angeles, California, a bomb explodes outside the offices of Swiss Precision Instruments. The attack is claimed by the Ninth of June. 11. On November 20, 1981, in Los Angeles, California, the Turkish Consulate General in Beverly Hills suffers extensive damage. The JCAG claims credit. 12. On January 13, 1982, in Toronto, Canada, an ASALA bomb causes extensive damage to the Turkish Consulate General. 13. On January 28, 1982, in Los Angeles, California, Kemal Arıkan, the Turkish Consul General in Los Angeles, is assassinated by two terrorists while driving to work. Nineteen year-old Hampig Sassounian is arrested and sentenced to life in prison. 14. On March 1982, in Cambridge, Massachusetts, a gift shop belonging to Orhan Gündüz, the Turkish Honorary Consul General in Boston, is blown up. Gündüz receives an ultimatum prior to the attack: Either he gives up his honorary position or he will be “executed”. Responsibility is claimed by the JCAG. 15. Two months later in May 4, 1982, Cambridge, Massachusetts, Orhan Gündüz, the Turkish Honorary Consul General in Boston, is assassinated. The murderer is still at large. 16. On April 8, 1982, in Ottawa, Canada, Kani Güngör, the Commercial Attaché at the Turkish Embassy in Ottawa, is seriously wounded in an attack by Armenian terrorists in the garage of his apartment complex. ASALA claims responsibility. 17. On May 18, 1982, in Toronto, Canada, four Armenians are arrested for trying to smuggle money out of the country. The money was extorted from Armenians. In the course of the investigation, it is discovered that the terrorists firebombed the house of an Armenian who refused to make his contribution to Armenian terrorism. 18. On May 18, 1982, in Tampa, Florida, the Turkish Honorary Consul General Nash Karahan is attacked at his office. 19. On May 26, 1982, in Los Angeles, California, a bomb damages the office of Swiss Banking Corporation. The suspects: four Armenians accused of involvement in ASALA. 20. On May 30, 1982, in Los Angeles, California, three members of ASALA are arrested when planting a bomb in the Air Canada cargo-office. Embassy, is assassinated in his car. The JCAG claims responsibility. 22. On October 26, 1982, in Los Angeles, California, five Armenian terrorists are arrested and charged with conspiring to blow up the offices of the Honorary Consul General in Philadelphia. 23. On January 21, 1983, in Anaheim, California, nine “sophisticated” pipe bombs are confiscated from an Armenian bakery after one of the detonators goes off and causes fire. 24. On March 29, 1984, in Los Angeles, California, ASALA sends a written threat, stating that they will assassinate Turkish athletes who take part in the Olympics. A news agency in France receives a written threat that terrorists will attack all governments, organizations, and companies that assist in any way Turkey's team at the Olympics. 25. On March 12, 1985, in Ottawa, Canada, three heavily armed terrorists storm the Turkish Embassy, killing a Canadian security guard in the process. After blowing up the front door, the gunmen enter the building. Ambassador Coskun Kirca manages to escape but suffers extensive injuries. The wife and daughter of the ambassador, who were taken hostage, are later released, and the terrorists surrender. ARA claims responsibility. 26. On March 26, 1985, in Toronto, Canada, a threat to blow up the city of Toronto's transit system leads to chaos during the rush hour. An “Armenian Secret Army for the Liberation of our Homeland” claims responsibility for the threat. Source: Samuel A. Weems. 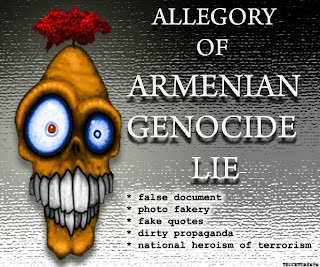 ARMENIA SECRETS OF A “CHRISTIAN” TERRORIST STATE The Armenian Great Deception Series – Volume 1 (Shortened Version), St. John Press, 2002, Dallas, USA.